Classic Baked Ziti features several hard working cooking techniques everyone should be familiar with in the kitchen. This dish makes a hearty meal that reheats beautifully so it’s definitely well worth the time investment & several shortcuts will have the dish prepared quickly. 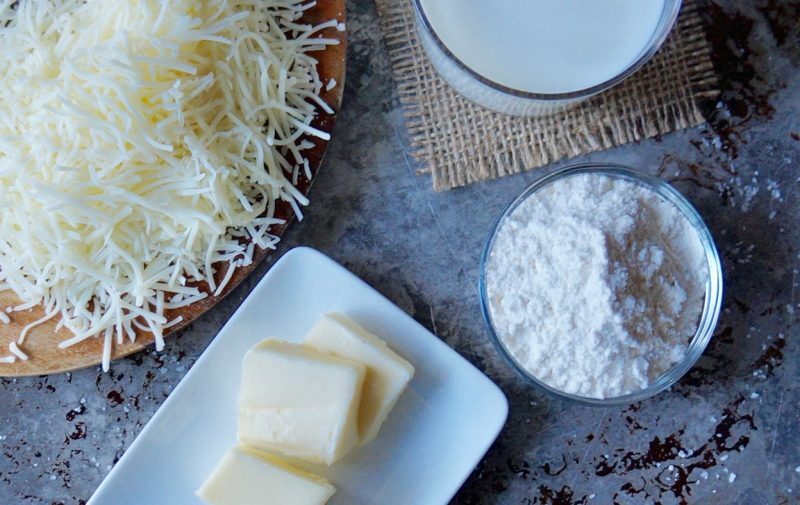 A cheese blend that is already prepared for your convenience saves valuable time when getting meals on the table for your family while multi-tasking pots & pans during the cooking process saves time on clean up. 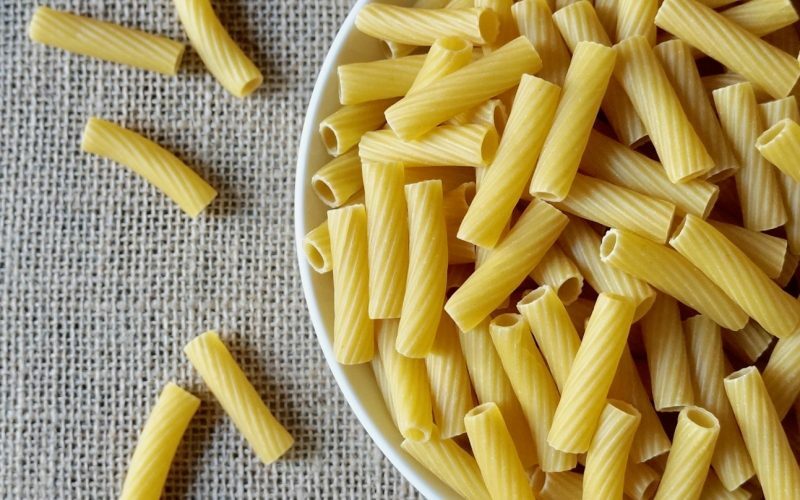 Follow my tips on The Basics: Pasta & get ready to make a classic Italian favorite the whole family will love. Cook the pasta in a Dutch oven according to package instructions. Drain & run under cool water to stop the cooking process. Set aside. Rinse the Dutch oven & use it to prepare the Mornay Sauce. Meanwhile, brown the beef in a 3-quart sautépan over Medium-High heat until no longer pink, about 8 minutes. Drain the beef & set aside. Add 1 teaspoon of the drippings back to the sautépan. Sauté the onion in the drippings over Medium heat until the onions begin to sweat & they become softened, about 8 minutes. Add the garlic & cook until the fragrance perfumes the kitchen about 20 seconds. Deglaze the pan with the wine & allow the steam to subside. Stir in the pasta sauce. Pour the water into the jar, return the lid & shake vigorously. Pour the mixture into the saucepan. Stir in the cooked beef, the basil, the crushed red pepper flakes & the salt & simmer the sauce on Medium-Low for 20 to 25 minutes, stirring occasionally. Preheat the oven to 350 degrees. Prepare the Mornay Sauce. Add the cooked pasta & toss well to coat. Coat a 13 x 9-inch deep-sided casserole dish with cooking spray. Pour the cheese coated pasta into the dish. Top with the meat sauce & sprinkle with the cheese blend. Bake 20 to 25 minutes or until throughly heated. Sprinkle with chopped basil & parsley. Once the cheese has been added, the sauce will thicken & become velvety smooth. Although the convenience of shredded cheese is used to prepare this family-friendly version, a blend of freshly grated Parmesan & Provolone cheeses would make an equally tasty sauce. Melt the butter in a Dutch oven & whisk in the flour. Cook for 1 minute over Medium heat. The mixture will become bubbly hot so whisk like crazy. Whisk in the milk taking care to smooth any lumps. Cook the mixture, whisking constantly, until thickened & bubbly, about 8 minutes. Turn off the heat. Whisk in the cheese & the salt. Use as directed. Baked ziti may seem like a difficult recipe to try as it features several cooking techniques but it isn’t & my streamlined method on how to make a family favorite pasta dish will guide you every step of the way. It can be prepared well in advance of the dinner hour & held in the refrigerator until you are ready to bake the dish at your convenience. 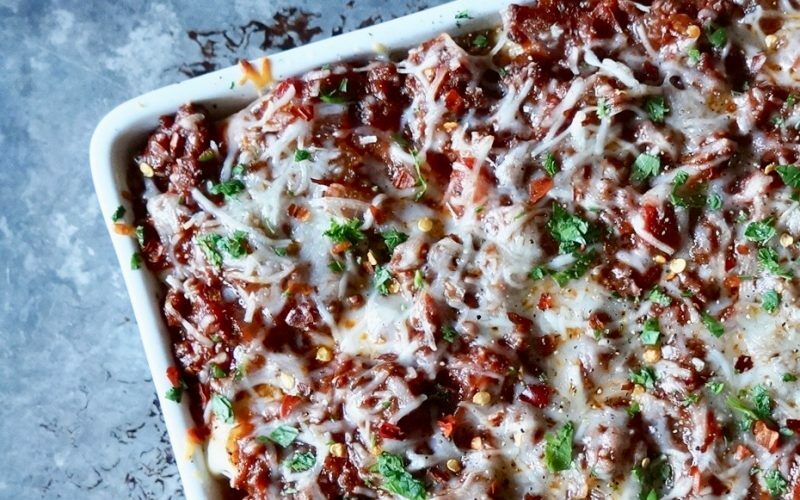 A few shortcuts will have the Spicy Baked Ziti oven ready in no time. 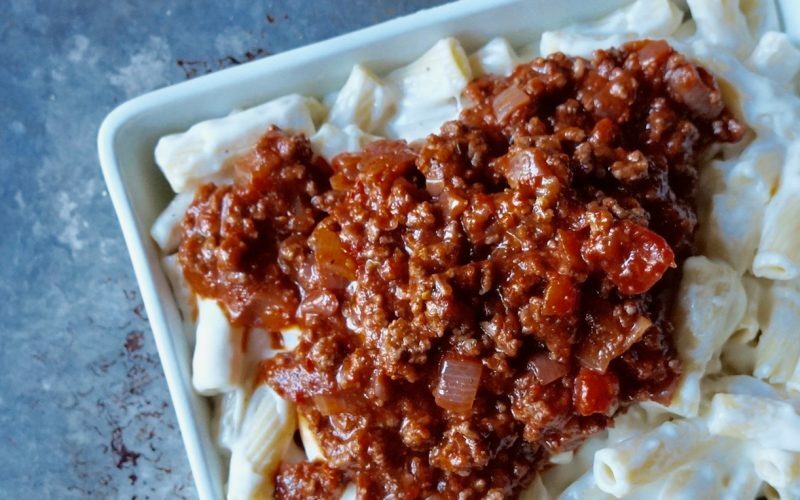 From the pasta preparation to the rich meat sauce to the quick mornay, here’s what you need to know. Spaghetti love meet mac & cheese love. 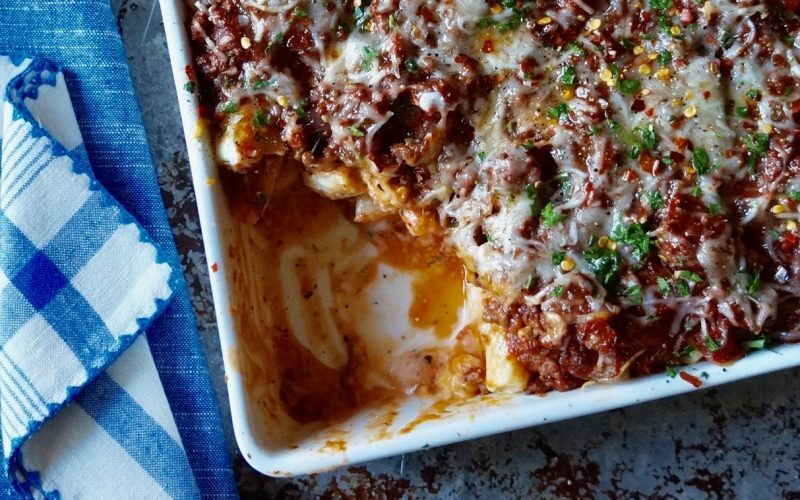 Baked pasta specialties feature a host of family favorite flavors you can count on time & time again when getting wholesome meals on the table. Pull up a chair & find out how to make this iconic Italian classic. Cook the noodles according to package instructions. Do not be tempted to add any oil to the water as it boils. You want the Mornay Sauce to cling to the pasta. 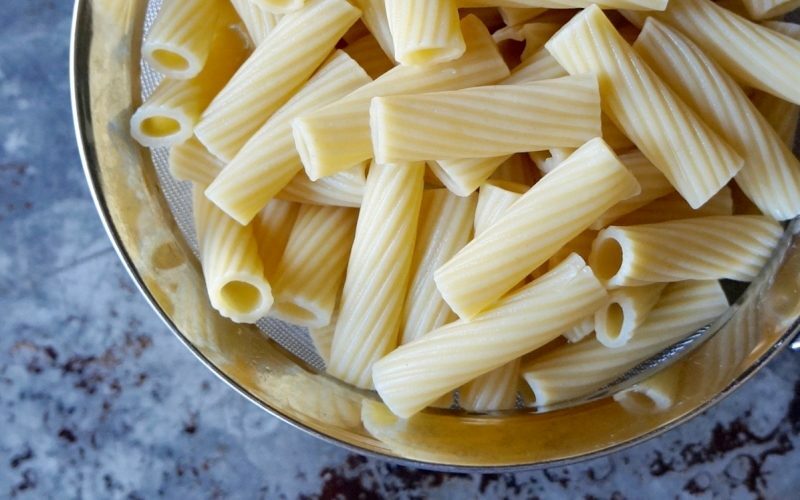 Ziti pasta noodles with ridges will further ensure that the cheese sauce will cling to them. 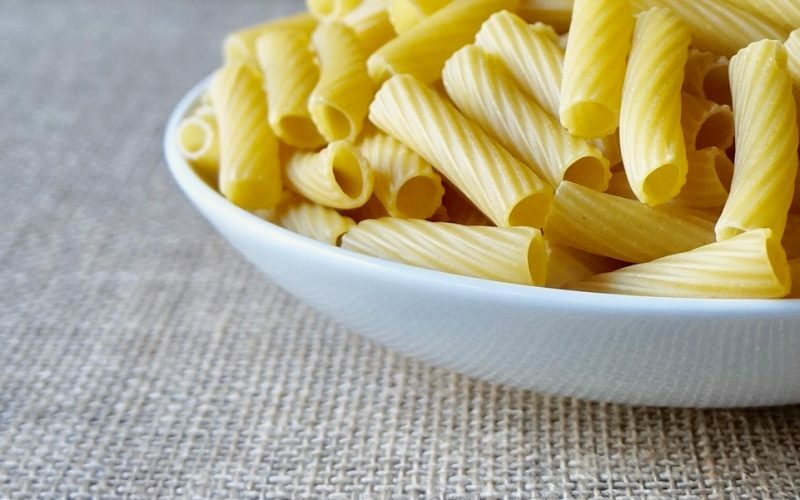 For additional guidance look to my pointers as outlined in The Basics: Pasta for advice on cooking a wide variety of noodle styles. Once the noodles have been cooked, rinse them under cold tap water to stop the cooking process. Rinse out the Dutch oven. It will be used to prepare the Mornay Sauce & toss together the cooked noodles. A Cabernet Sauvignon or Pinot Noir are ideal red wine varieties to use when preparing the meat sauce as they offer a bold punch of flavor. 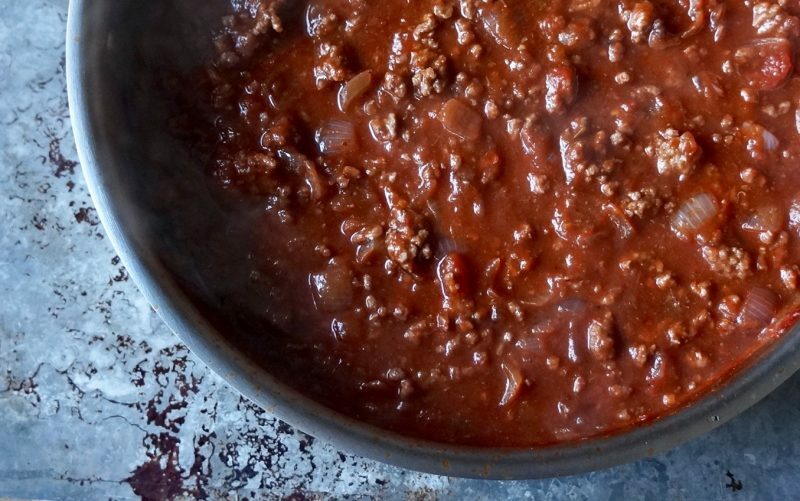 Ideally, you want the meat sauce to tighten up a good bit. Simmer the mixture until thick but still saucy. A mornay sauce starts with one of the five classic French mother sauces, a béchamel. 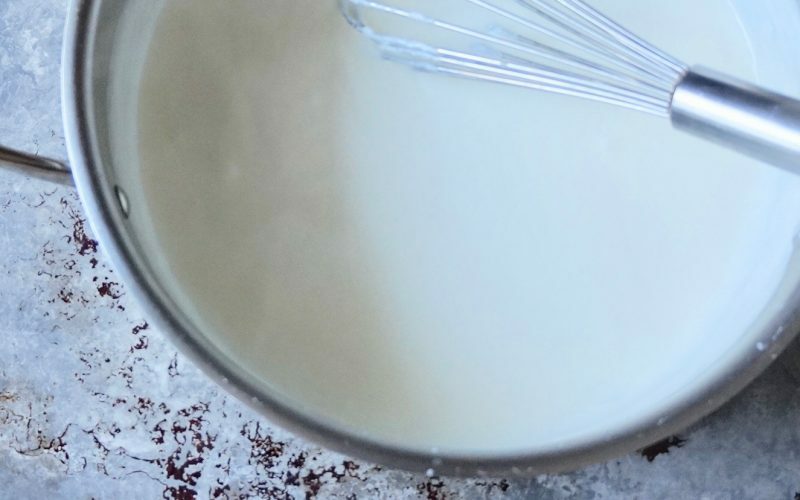 A béchamel is a light roux that begins as a white sauce. It becomes a mornay sauce when the cheese is added to it. 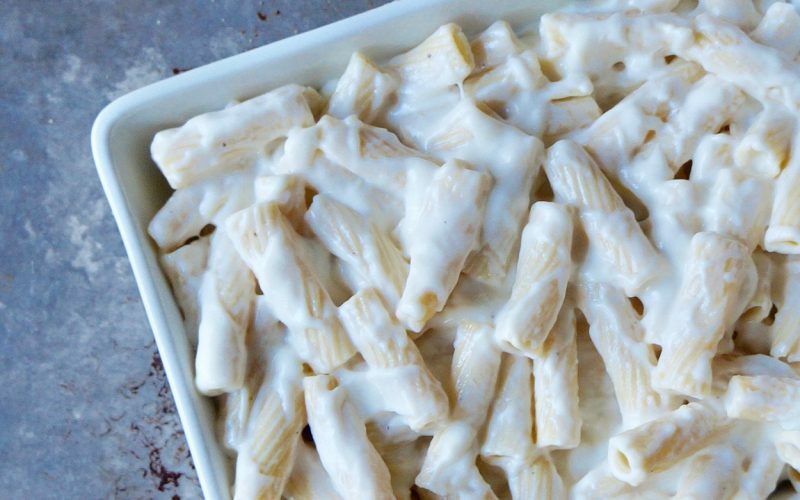 Once the cooked ziti noodles have been coated with the Mornay Sauce, the recipe can be assembled. 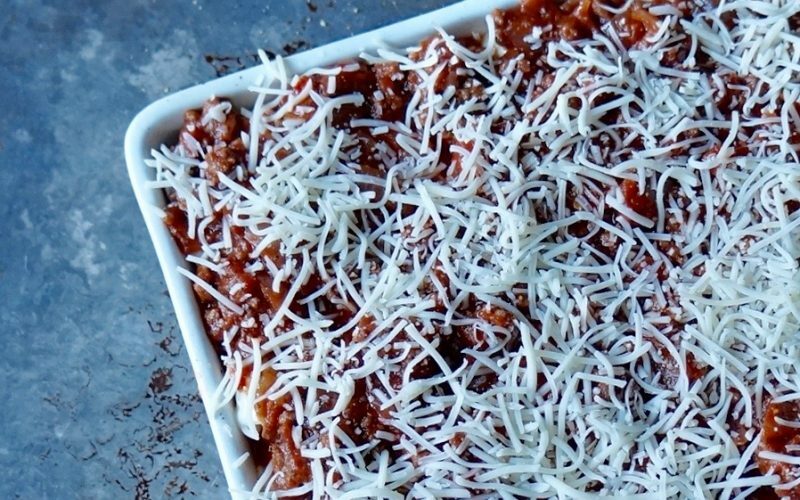 Pour the coated pasta into a deep-sided, lightly greased casserole dish. The mixture can be divided between two smaller dishes, if desired. Adjust the bake time accordingly & bake a bit less, if necessary. Push the pasta noodles down into the dish & top them with the prepared meat sauce. Spread the sauce evenly over the surface & allow it to fill any open crevasses. Sprinkle the cheese over the surface of the meat sauce. The casserole dish will be full. 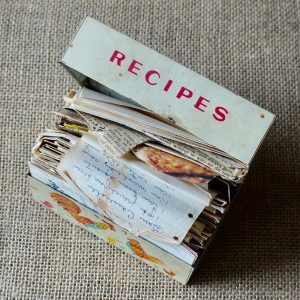 At this stage, the layered recipe can be held to bake another time. Cover it with plastic wrap. Chill up to 24 hours before baking as directed. Add additional time to be certain the food is nice & hot before serving. To bake the recipe right away, place the dish on a half sheet pan. This will make it easy for depositing & retrieving the dish from the oven. Bake the recipe as directed according to the instructions that have been provided. 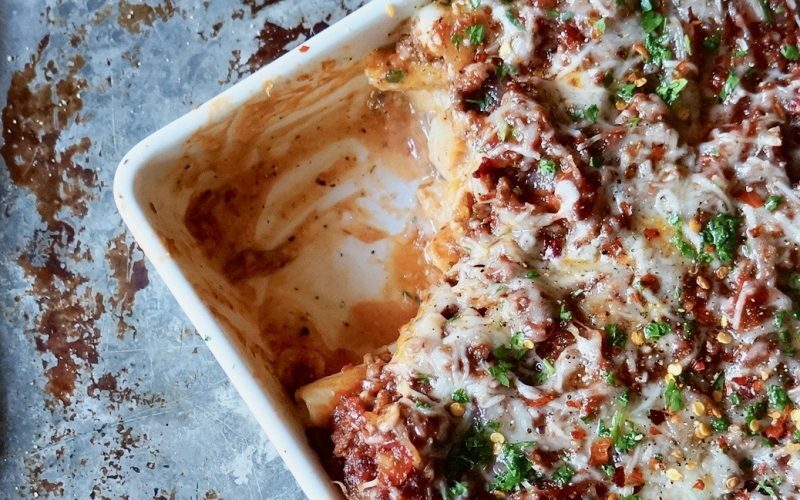 You want the Classic Baked Ziti to be warm throughout & the cheese over the surface to melt.